The incident illustrated the still-flaring tensions from a couple of weeks ago when officers with the Department of Public Safety met McNutt outside Bonnen's home while the speaker was in Austin. The troopers had already been monitoring Bonnen's home after McNutt visited homes of other lawmakers whom he has blamed for inaction on "constitutional carry" legislation that would allow Texans to carry guns without a permit. Bonnen accused McNutt of intimidation tactics, and the revelation of the home visits dealt a death blow to the constitutional carry push at the Capitol. The latest incident unfolded Tuesday evening inside the JW Marriott hotel in downtown Austin, where the state Republican party was holding its annual spring fundraising dinner. The headliners were the "Big Three" — Bonnen, Gov. Greg Abbott and Lt. Gov. Dan Patrick. McNutt was invited to the fundraiser by Darlene Pendery, a top Republican donor who had purchased three VIP tables to fill with 30 guests. She said she invited McNutt and Bonnen before the controversy surrounding McNutt's travel to lawmakers' homes. McNutt did not respond to requests for comment Wednesday, but both Bonnen and Pendery offered detailed accounts of the evening. Pendery said it was a "horrible night" marked by Bonnen looking for a fight and losing his cool; the speaker said it was McNutt who took it too far, well aware of the situation he was creating. 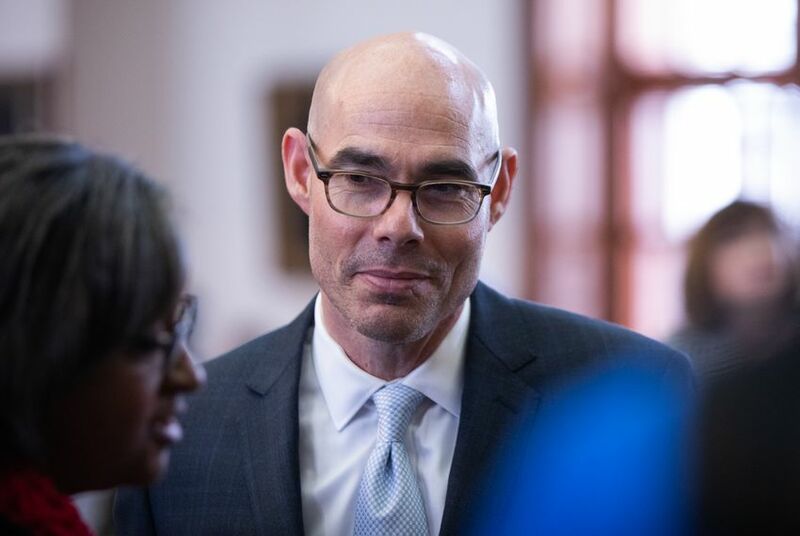 Bonnen said he first learned about McNutt's attendance at the fundraiser earlier in the day when some fellow lawmakers gave the speaker a heads-up that the activist would be there and might try to confront him. Bonnen said he then inquired about the situation with organizers and was assured he would not be seated with McNutt. Bonnen nonetheless ended up seated back-to-back with McNutt — at the table next to his, the speaker said. As the dinner was getting underway, Bonnen said he walked up to McNutt, tapped him on the shoulder and shook his hand. "'Hi, I'm Dennis Bonnen,' I said," the speaker recalled. "'You should never go to my residence or any member of the Legislature's residence when you know they're in Austin doing their job. I want you to tell me you're never gonna do that again.'" Pendery said the initial interaction was not so innocent, with Bonnen appearing "out of nowhere" and confronting McNutt and raising his voice while the activist was trying to eat his salad. In any case, McNutt remained quiet while the speaker talked to him, according to both Bonnen and Pendery. Then, Bonnen said, McNutt handed the speaker an envelope with a letter personally addressed to him. Bonnen said he took the letter and expressed some gratitude to McNutt, saying the letter was an appropriate way to advocate for an issue as opposed to going to lawmakers' residences. That was not the end of it, though. In Bonnen's telling, something strange then happened: An unidentified man seated next to McNutt handed the speaker a Kool-Aid packet. Bonnen said he tossed the packet on the table, prompting the man to stand up and threaten a "physical altercation." The man, Bonnen said, "kinda got in my face and said, You should just leave.'" While Bonnen did not identify the man, Pendery said another one of her guests, David Wylie, stood up and tried to defuse the situation. But ultimately Wylie "urged [Bonnen] to leave after several attempts to reason with him," Pendery said. While their accounts weren't identical, Bonnen said he ultimately obliged with the suggestion he should leave. "I'm the speaker of the House," Bonnen said. "I don't need to be in that type of confrontation. So I left." Bonnen's departure came before he was set to speak at the event, a major annual fundraiser for the Texas GOP. Party officials did not respond to messages seeking comment Wednesday. Pendery has become one of the state's larger Republican donors, perhaps best known for bankrolling primary challengers in state House races and boosting other anti-establishment causes. In the 2018 election cycle alone, she donated almost $740,000 to GOP candidates and groups at the state level, according to records with the Texas Ethics Commission. Among the candidates she supported was Bonnen’s primary challenger, Damon Rambo, who got a $10,000 contribution from Pendery. In an email, Pendery defended McNutt's activism, saying she has talked with him at length about the recent drama and believes he is "guilty of nothing more than flyer distributing." Bonnen, of course, sees it differently. "We're at a point where these people think that threatening your family ... and then setting up confrontations in public where they mock you and lie about what has occurred is the way to participate in the process," Bonnen said. "It's destroying the process, quite frankly."